How adorable is my friend’s daughter? Jillian just had to share this too-cute photo of her youngest trying out her Halloween costume, a Canadian Tuxedo-clad Cowgirl. Spencer is seen here in a matching denim jacket and skirt by Haven Girl (complete with cowboy boot embellishing on the back). 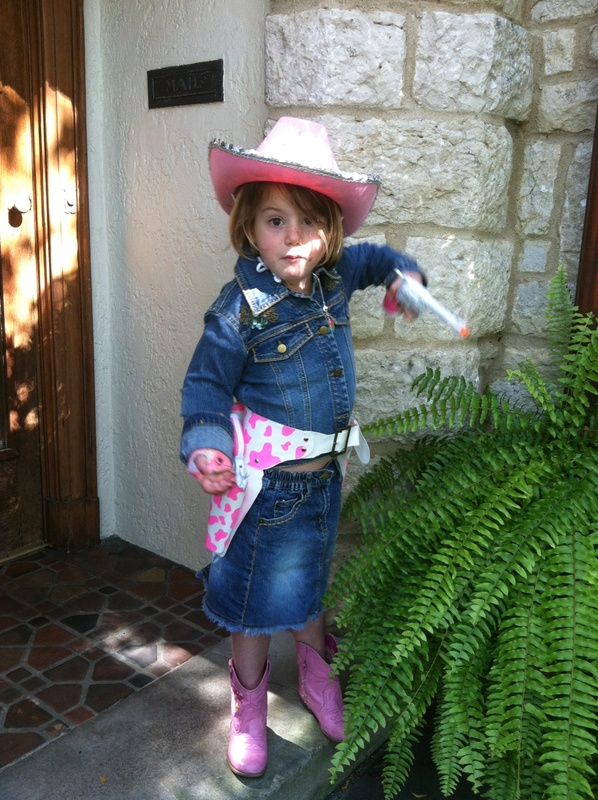 She’s coordinated her pink cowgirl boots, holster, gun and hat to match her pink arm cast – this girl is a wild one! I seriously can’t get enough. This entry was posted on Thursday, October 11th, 2012 at 8:47 am	and tagged with Bexley, Canadian Tuxedo, Columbus, cowgirl, Denim, Denim on Denim, double denim, Fashion, Halloween, Haven Girl, Jeans, Jillian Farley, Jillian Stout and posted in Babies, In The Wild. You can follow any responses to this entry through the RSS 2.0 feed.